A Daal curry that has all the four common lentils available in an Indian pantry. A busy Saturday after noon in the kitchen, after an hour long mental negotiation I decided on making Daal and rice.I chopped the onions, slit the green chillies, sliced the garlic and opened my cupboard to scoop out a heap of daal to the pressure cooker. Should I say I was disheartened to see just a spoon of daal where I was hoping for a heaped cup.I am sure there are many of you who would have found yourselves in similar situations. I didn’t want to engage myself in another hour long process of deciding on an alternate dish for the lunch. I braved myself to proceed with the same recipe but with a mix of different Daals to make up the amount of Toor Daal, the original recipe called for. This is how I did it. 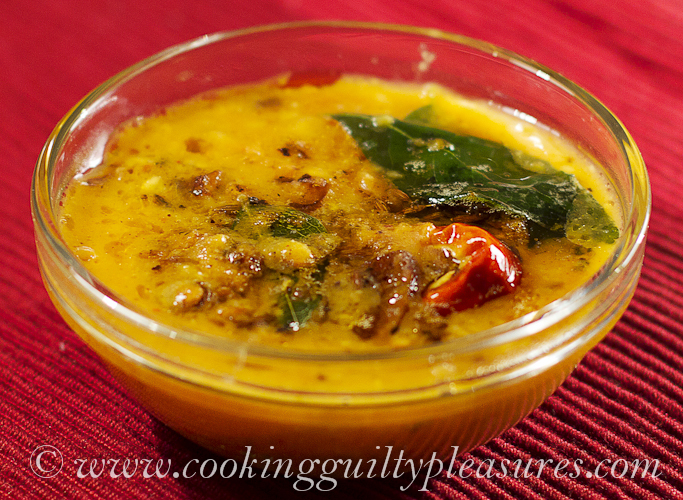 Soak all the Daals for about half an hour and cook until soft with the turmeric powder, chilli powder and salt. Heat 2 tsp of oil in a pan. Sauté the onion, ginger and green chillies for about 3-4 minutes until the onion turn translucent. Add the chopped tomatoes, mix in the Cumin powder and fry till the tomatoes are cooked through. 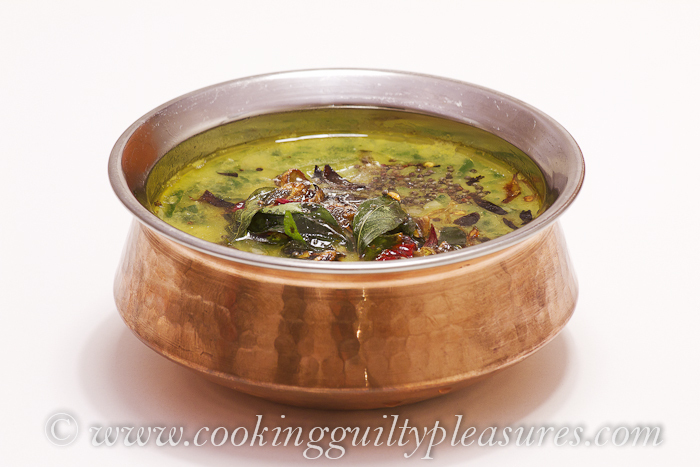 Add the cooked Daal into the mixture and boil for about 5 – 6 minutes on low flame .Remove from the heat. For seasoning, heat oil/ghee in a pan. Add the cumin seeds, when they start to brown add the chopped garlic, curry leaves and red chilli. Fry till the garlic turns brown. Pour the seasoning to the Daal , leave it covered with a lid until it is served. This is going to be my entry for this year’s first edition of My Legume Love Affair hosted by Simona of Briciole , a popular blog event created by Susan of The Well Seasoned Cook.